Preheat oven to 350 degrees. The first thing we’re going to do is rinse the chicken and pat it dry. Place the chicken in a Ziploc bag, then pound it with the smooth side of a mallet. You will want to pound them to approximately 1/4-1/2″ thick. Lay the chicken down on a cutting board, and place a 1-2″ piece of goat cheese and 4-5 pieces of asparagus on the center of each cutlet. I know that working with raw chicken is not very fun – but I promise, we are almost done. 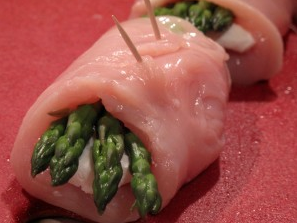 Wrap the chicken around the goat cheese and asparagus, and secure with 1-2 toothpicks. For your friends 🙂 Prepare egg wash (1-2 eggs + a tablespoon or two of water) in one dish. In a separate dish, add the panko and your seasonings of choice. Once the cutlet is seasoned and dredged in the panko mixture, place on a foiled lined baking sheeting while you repeat with the rest of the chicken cutlets. Dredge each cutlet in the egg wash followed by the panko mixture. Now bake for about 30 minutes – just long enough for the cheese to melt and for the panko breading to turn a delicious golden brown.